The Niagara Falls are made up of three massive waterfalls on the Niagara River, straddling the international border between the Canadian province of Ontario and the U.S. state of New York. 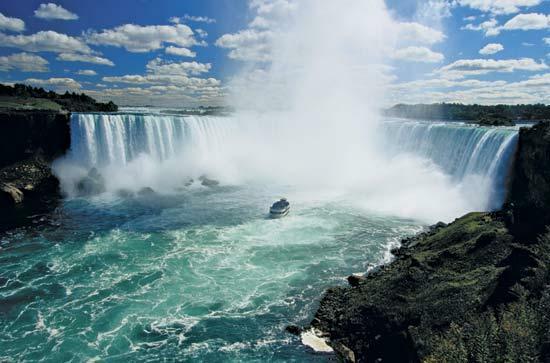 The falls are 17 miles northwest of Buffalo, New York and 75 miles southeast of Toronto. 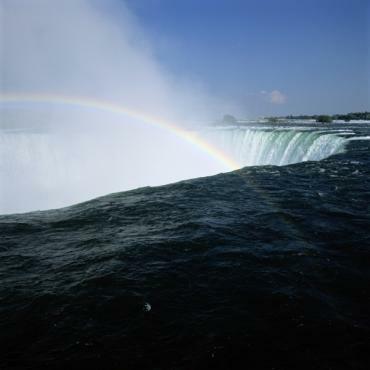 The Falls were formed when glaciers receded at the end of the last ice age, and water from the newly-formed Great Lakes carved a path through the Niagara Escarpment en route to the Atlantic Ocean. While not exceptionally high, the Niagara Falls are very wide. More than six million cubic feet of water falls over the crest line every minute in high flow and almost 4 million cubic feet on average. It is the most powerful waterfall in North America. The two major sections are separated by Goat Island: Horseshoe Falls, on the Canadian side of the border and American Falls on the U.S. side. The smaller Bridal Veil Falls also is located on the American side, separated from the main falls by Luna Island. The American Falls feature a variety of adventures to help you make the most of your trip. Dine at the Top of the Falls Restaurant, walk right up to the base of Niagara Falls during the Cave of the Winds tour, or let the water fall all around you during the Maid of the Mist boat ride (April – October). Horseshoe Falls offer similar tours by day and is illuminated by colourful spotlights by night. Along with the array of attractions, hotels and restaurants this as close as Canada comes to the gloss of Las Vegas. Just 15 minutes north of the Falls rests the small, pretty village of Niagra-On-The-Lake. 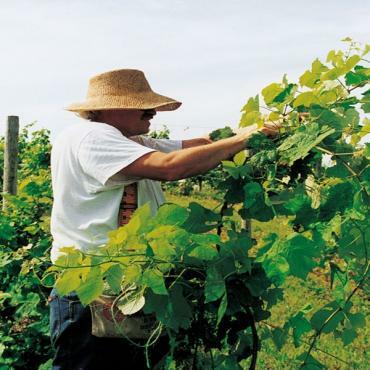 With an impressive array of vineyards, Niagara-on-the-Lake wineries produce award-winning vino, including the region's famous ice wines. At similar latitude to the Bordeaux region of France the Niagara climate is ideal.